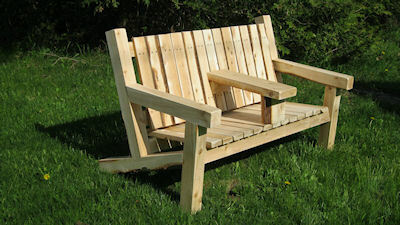 We make and sell quality rustic looking White Cedar Furniture such as our picnic tables, double seated bench with or without a center table, single chairs, log bed frames and tables. You can also check with us if you have a special request. All of our furniture made is with two of the following styles which are, the Rounded Log look, and the 4"x 4" look this is where we four side the wood on a planer. There is no other wood species like Northern White Cedar that will not have bug infestation and the rot like other wood species have. The one thing we do recommend is that you treat your furniture with a clear lacquer finishing product. 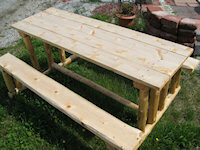 Large Cedar Bench, 4" x 4" Structure, 5' in length, made for adults, with or without center armrest. $195 plus shipping. 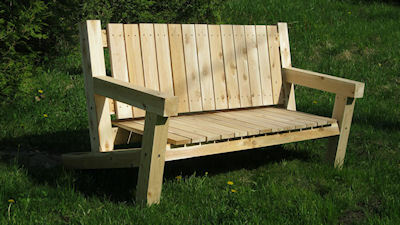 Small Cedar Bench, 3" x 3" Structure, 4' in length, made for children, with or without center armrest. $175 plus shipping. 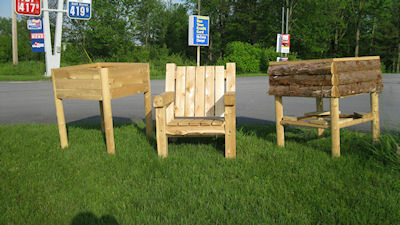 Large Chairs 4" x 4" Structure, approx. 22" wide. Small Chair 3" x 3" Structure, 16" wide. 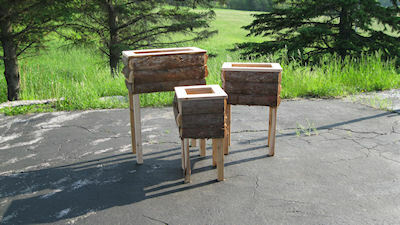 Cedar Planters, 2' x 2' – 3' high, 2' x 1' - 2 ½' high, or 1' x 1' – 2' high. 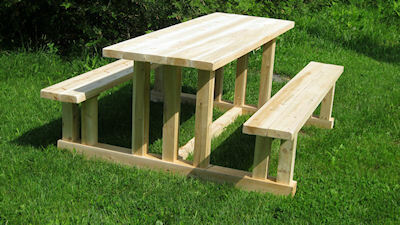 Picnic tables, 4" x 4" & 3" x 3" Structure, has 2" thick table & seats, 6' long. 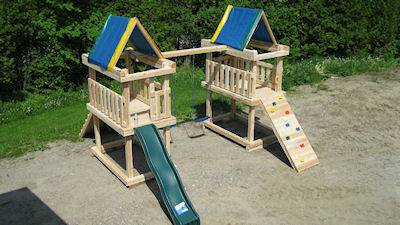 Play Sets have 4" x 4" Structure - Shown in photo is a 2 tower play set. Colors used in play sets may vary. 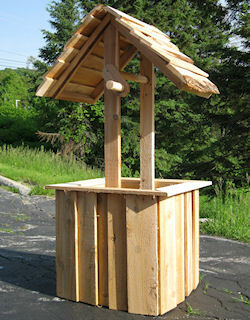 Cedar Wishing Wells, 2' x 2' Square, Approximately 5' high. There is a waiting time on all of our furniture because of production time it takes. We ask that you be patient with your request and our time to deliver your product. Due to the nature of cedar, coloration of products may vary. For more information, contact us at 802-868-5590 (mill) or 802-868-5591 (home), or click here to email us.